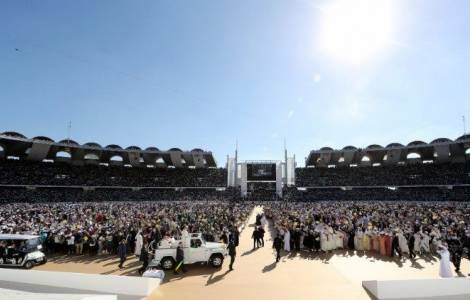 Abu Dhabi (Agenzia Fides) - The baptized "let them not get into arguments or disagreements, but be subject to every human creature out of love for God, and let them profess that they are Christians". This is the famous quote by Saint Francis, when he gave his brothers instructions about approaching "the Saracens and non-Christians", contained in the "Regula Non Bullata" was proposed again by Pope Francis as a way of presence to the multitude of Christians of the Arabian Peninsula who took part in the Mass celebrated by the Pontiff at the Zayed Sports City in Abu Dhabi, on the second and last day of his apostolic visit to the United Arab Emirates: more than 40 thousand faithful crowded the stadium, while another 90 thousand listened to Pope Francis outside the structure, in the most crowded Eucharist liturgy ever celebrated in the Arabian Peninsula that also recorded the respectful and intrigued participation of thousands of Muslims. "Neither arguments nor disagreements. And this - added Pope Francis - is also valid for priests. At that time, as many people were setting out, heavily armed, Saint Francis pointed out that Christians set out armed only with their humble faith and concrete love. Meekness is important: if we live in the world according to the ways of God, we will become channels of his presence; otherwise, we will not bear fruit". The Pope’s homily started from the word "blessed": this is the word with which Jesus begins his preaching in Matthew’s Gospel. And it is the refrain he "repeats today, as if to fix in our hearts, more than anything, an essential message: if you are with Jesus, if you love to listen to his word as the disciples of that time did, if you try to live out this word every day, then you are blessed. Not you will be blessed, but you are blessed; this is the first truth we know about the Christian life". This experience - the Pope continued - is the source of joy, "a joy that no one in the world and no circumstance in our lives can take from us. It is a joy that gives peace also in the midst of pain, a joy that already makes us participate in that eternal happiness which awaits us".